Australia is considered a highly food-secure nation; however, this is not always the case for every individual, household, and community. 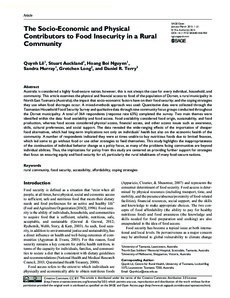 This article examines the physical and financial access to food of the population of Dorset, a rural municipality in North East Tasmania (Australia); the impact that socio-economic factors have on their food security; and the coping strategies they use when food shortages occur. A mixed-methods approach was used: Quantitative data were collected through the Tasmanian Household Food Security Survey and qualitative data through nine community focus groups conducted throughout the Dorset municipality. A total of 364 respondents (response rate 63%) completed the survey. Two main themes were identified within the data: food availability and food access. Food availability considered food origin, sustainability, and food production, whereas food access considered physical access, financial access, and other access issues such as awareness, skills, cultural preferences, and social support. The data revealed the wide-ranging effects of the importation of cheaper food alternatives, which had long-term implications not only on individuals’ health but also on the economic health of the community. A number of respondents indicated they were at times unable to buy nutritious foods due to limited finances, which led some to go without food or use other strategies to feed themselves. This study highlights the inappropriateness of the continuation of individual behavior change as a policy focus, as many of the problems facing communities are beyond individual abilities. Thus, the implications for policy from this study are centered on providing further support for strategies that focus on ensuring equity and food security for all, particularly the rural inhabitants of many food-secure nations.